The coyote (Canis latrans) is one of the most adaptive of all wildlife species. Coyotes are found throughout North America from agricultural areas to urban areas such as Indianapolis. Historically, coyotes were most commonly found on the Great Plains of North America. However, with the removal of larger predators, changes in land use patterns, and the decrease in fur harvest and predator control, the coyote’s range has expanded and now reaches from Central America to the Arctic. Coyotes are both more abundant and more widely distributed today than when the U.S. Constitution was signed. One of the keys to the coyote’s success is its varied behavior and diet. It is an opportunistic feeder and will eat almost anything. Coyotes prey on domestic livestock, poultry, deer and other wildlife, and, in suburban areas, cats and dogs. They also consume carrion, fruits and insects. 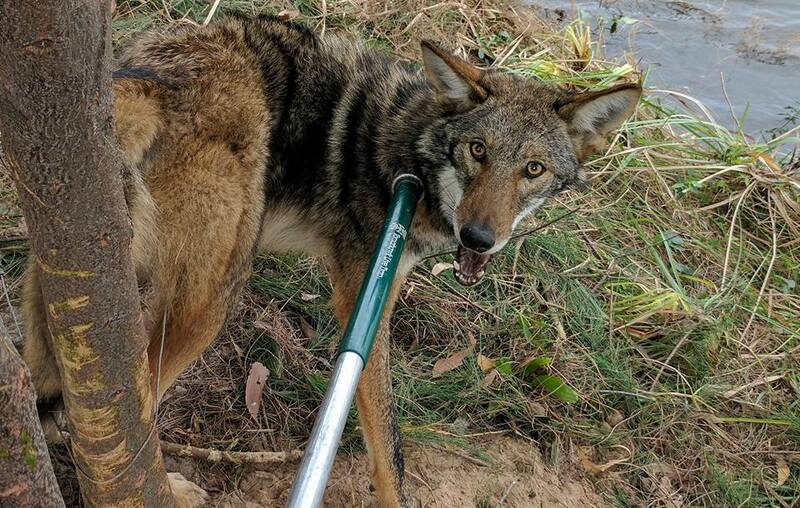 Coyotes that have adjusted to human population expansion, or dispersed into developed suburban landscapes unoccupied by other coyotes, tend to thrive in such environments. The ready supply of food, water and shelter helps coyotes survive in the suburbs and makes them tend to lose their fear of humans. Suburban coyotes have access to rodents, rabbits, household garbage, compost piles, pets, pet food, and water from ponds and landscape irrigation run-off. In addition, some people intentionally feed coyotes. Lush home landscapes and greenbelts within suburban areas attract food for coyotes and give coyotes space to move around. The abundance of food regulates coyote numbers, reproduction, survival, dispersal and territories. In the wild, coyotes generally have home ranges of 3 to 16 square miles. But in suburban areas, where resources are plentiful, coyotes may need only 1/4 to 1/2 square mile. This can lead to large coyote populations. Canis latrans is the scientific name for coyote; it means barking dog. They are less than 2 feet tall and have erect, pointed ears, a slender muzzle and a bushy tail. Coyotes are brownish gray with a light gray to cream-colored belly. However, color can vary from nearly black to nearly white. Most coyotes have dark hairs over their backs and tails. Male coyotes weigh 25 to 50 pounds. Female coyotes weigh 22 to 35 pounds. Coyotes live an average of 6 years in the wild. Coyotes breed in January and February and have a gestation period of approximately 63 days. The young are usually born in March, April or May. An average coyote litter is five or six pups. However, the reproductive potential of female coyotes is generally connected with population density and can range from three pups per litter in large populations to 12 pups per litter in smaller populations. Urban coyotes may make their dens in storm drains, under storage sheds, or in holes dug in vacant lots, parks, golf courses and similar sites. Coyotes are most active at night and in early morning, but can be seen any time during the day. Coyotes can be carriers of rabies and other diseases that could threaten public health. Average 25 to 45 pounds. Grizzled gray or buff overlaid with black. Tracks are similar in appearance to dogs. Approximately 63 days. Litter size: Five to seven. One litter per year, usually born in March, April or May. Generally 6 to 8 years in the wild. Coyotes are extremely cautious of humans in areas where they are harassed, hunted or trapped. However, in suburban areas, where they have lost their fear of humans, coyotes may associate people and their pets with an easy and dependable source of food. Like other wild animals, coyotes that have lost their natural fear of humans are more likely to approach people and may threaten human health and safety. Do not put feed or water out for coyotes or for other wild animals that are prey for coyotes (e.g., deer, rabbits, etc.). Construct and position bird feeders so that coyotes and their prey (squirrels and rodents) cannot get to the feed. Secure garbage and/or compost piles where coyotes cannot get to them. Make sure garbage containers are firmly fixed and have tight-fitting lids. Feed pets indoors whenever possible. Pick up any leftovers when feeding outdoors. Store pet food where wildlife cannot reach it. Trim shrubbery that provides hiding cover for wildlife. Do not allow pets to run free. Provide secure nighttime housing for them. Walk your dog on a leash and accompany your pet outside, especially at night. Discourage coyotes from coming to your area. If you start seeing coyotes around your home or property, chase them away by shouting, making loud noises, and throwing sticks or rocks. Making your neighborhood less welcoming to coyotes can greatly reduce the possibility of human/coyote encounters by encouraging coyotes to stay in their natural habitat, away from residential streets and yards. Coyotes are classified as furbearers in Indiana. Other furbearers include opossum, mink, skunk, weasel, raccoon, muskrat, fox, and beaver. Under state law, a landowner or tenant may take furbearing animals at any time on their own land if they are causing damage. Coyotes can be taken at any time of year using legal methods by landowners and by others who have written permission of the landowner. Coyotes can also be taken during the legal trapping season with a trapping license. The coyote must be euthanized or released in the county of capture. Homeowners who have trapped and relocated/euthanized a coyote must report it to IDNR within 72 hours of capturing or euthanizing the animal. Permission from the property owner must be obtained prior to releasing an animal on their property. Individuals with nuisance wild animal control permits can assist homeowners with nuisance coyotes. The names of licensed nuisance wild animal control operators and additional information can be obtained from the Indiana Wildlife Conflicts Information Hotline at 1-800-893-4116.